I have a collection of snowmen that I started many years ago but I have not added to it in years. Until now. 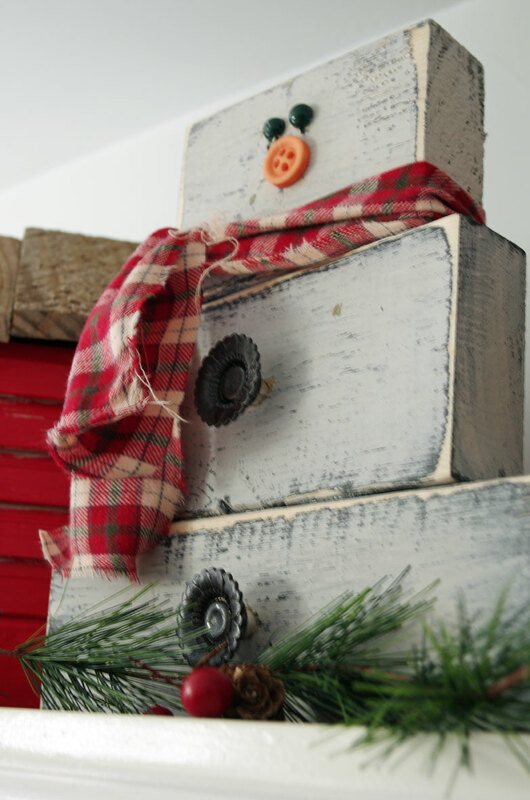 I can’t wait to show you how to make a primitive wooden snowman like the one I just made. I just added this cute guy to my collection and I love it! 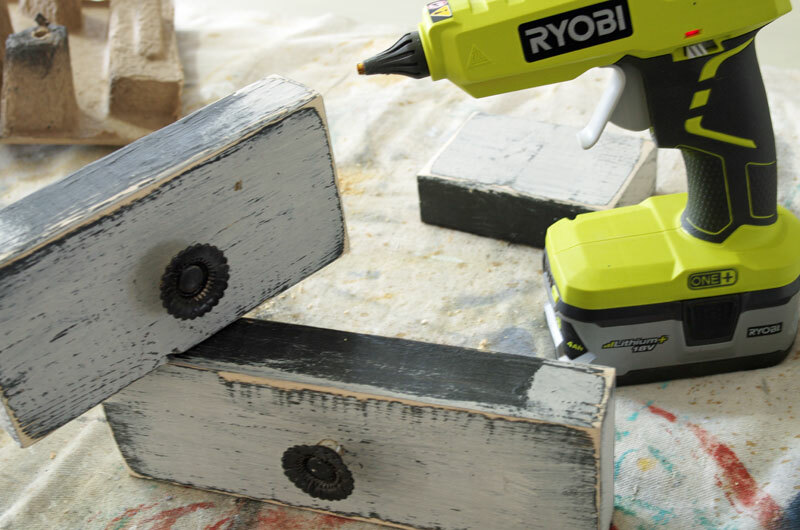 It’s super easy to make and you can use scrap wood to make it too. Which saves $$$! And who doesn’t want to save money at this time of year. In fact, I didn’t spend a dime to make this snowman. Now that’s my kind of craft! 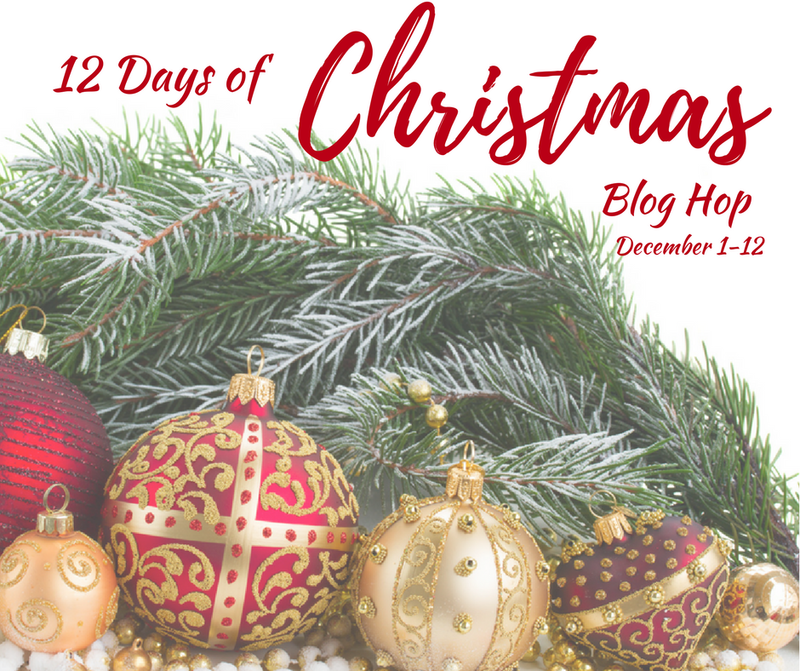 Welcome to the third annual 12 Days of Christmas Blog Hop! Today is the Third Day of Christmas Blog Hop! 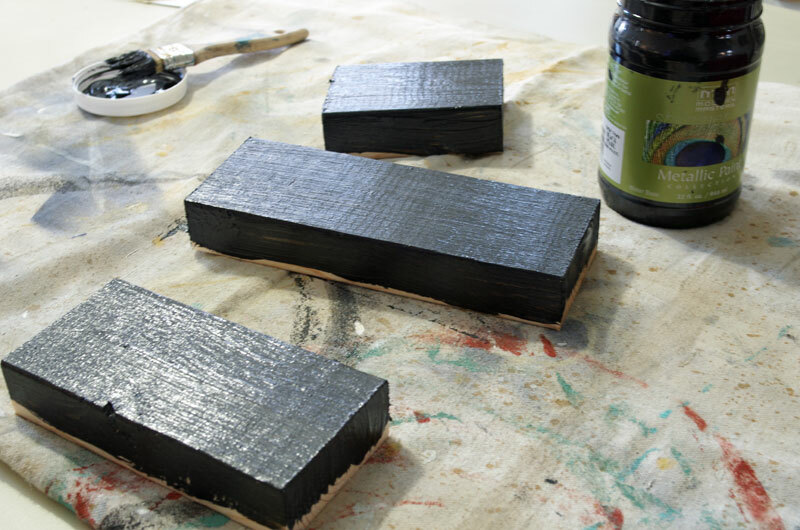 Start by painting the wood scraps with a dark paint (or stain). Allow to dry. While the paint was drying, I looked through my hardware stash and found some drawer knobs that I had previously received from D Lawless Hardware. The only problem was they were a little bright and new-looking. Nothing a a coat of Oil Rubbed Bronze spray paint couldn’t fix! 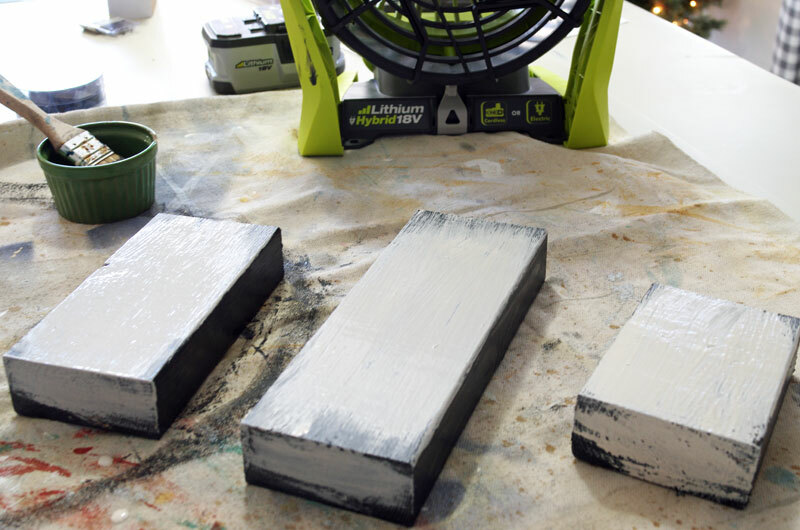 Once the paint was dry I sanded the edges of the wood pieces to reveal the black and wood underneath. Then using my power drill , I drilled holes and used my hot glue gun to attached the painted knobs to the wood pieces. Lastly, I glued the three pieces of wood together, tied a scrap of fabric around the “neck”, and hot glued on buttons for the eyes and nose. I had just the spot for my new primitive snowman on top of the hutch, right beside the red birdhouse that I made out of an old thrift store shutter. He’s cute, I love his little button nose!! 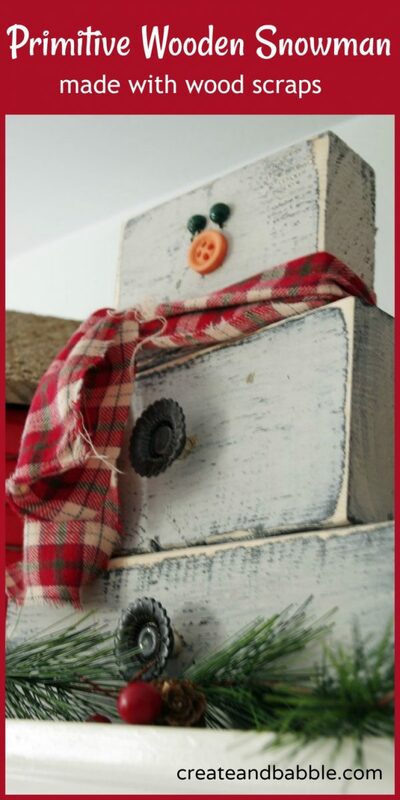 This is a great way to use up scrap wood and I really like the drawer pulls for buttons. 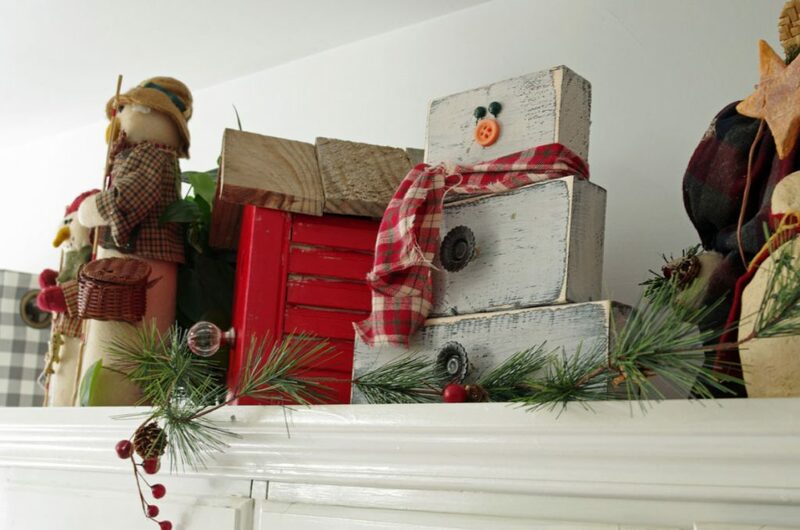 I love your snowman – great way to reuse drawer knobs! What a great way for me to use up some of my scrap wood!